We build all cages and trays on-site. We only use the highest quality wire mesh on the market. The gear on our farm has been in the water for more than six years and we have yet to replace a single tray due to corrosion or everyday wear and tear. Click on the link below to see our most popular cage and tray sizes. We can also custom-build cages and trays to your specifications. Pre-cut wire kits are also available. 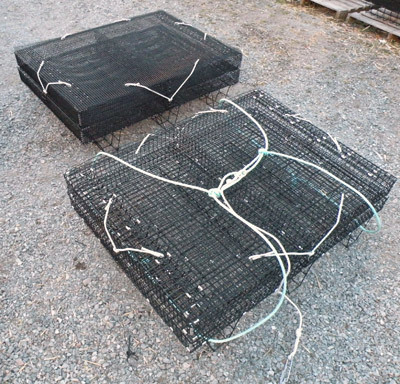 Float bags are an easy and inexpensive way to start growing some oysters of your own. 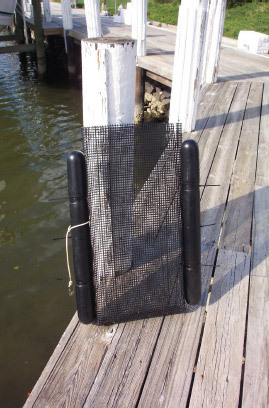 Simply empty some seed oysters into a float bag and tie it off to your dock. Give the bag a shake and a flip every few weeks and watch your oysters grow! 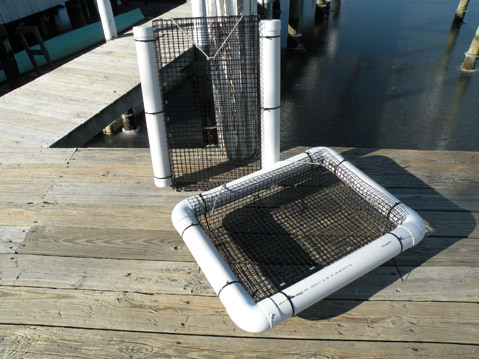 Floats, zip ties and mesh bags are all UV-resistant for durability. Float bags can be shipped UPS and make a perfect gift for the waterfront homeowner who has everything! Our customers typically give the float bag as a gift, along with a gift certificate for oyster seed which the recipient can get from us whenever they are ready. Click here for more information. Our newest designs provide easy access to your oysters (like the float bags) but enables the grower to raise larger quantities of oysters. Contact us for more information.